Masterji Indervadan Trivedi was the producer, director and choreographer for two local groups of young artists – Khusbu and Gayatri – and trained around 62 budding performers and artists. STAFFORD: The much awaited variety show, Dilwalon ki Mehfil (A Gathering of Heartful Souls) produced by the well-known local icon Indervadan Trivedi, better known affectionately as ‘Masterji’, was presented on Saturday, January 12 to an adoring audience at the Old Stafford Community Center on Constitution Avenue. 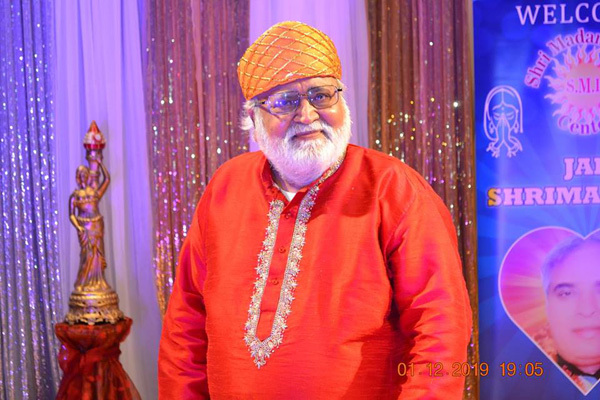 Masterji, who is also the president of the Shree Madan Dham Center of Houston (a religious non-profit) was the producer, director and choreographer for two local groups of young artists – Khusbu and Gayatri – and trained around 62 budding performers and artists. The result was a magnificent work which transported the audience to the world of thrilling Bollywood dances, music, songs and qawali. Masterji himself performed beautifully in the opening group dance, based on the title song of the new Hindi film Simba. The entire program was based around the Bollywood theme to harness the younger generation, while also appealing to an older crowd, to keep interest alive in Indian culture and heritage, a central mission of Masterji’s outreach SMDC group. Chandrakant Sharma, the owner of Asiana Restaurant and also known for his support of the community, was the chief guest of the program. The prodigious masterji bestowed awards of recognition upon production manager Anand Trivedi, Mukul Gandhi, Rasesh Dalal and this reporter for their outstanding performance to keep up Indian societal values and cultural heritage in Texas and especially in Houston. Rasesh Dalal, president Kala Kunj, performed as the emcee with his hilarious delivery for the 3-hour long show, keeping the audience entertained and energized. Bud Patel and Vibhas Dhurandhar, promising actors from Houston, presented the melodious and hilarious song ‘Ek Chatur Nar’ from the film Padosan with Khusbu. It was an entertaining and thrilling experience which took many back to the older era of Hindi cinema. The young girls of Khusbu and Gayatri group thrilled the audience with their scintillating dance performance. The audience was enthralled with the performance of Masterji with his qawali giving them a standing ovation. Mohsin Bhai impressed with his imitation of the voice of legendary singer Mukesh, performing many of his songs. Khyati, Naiya and Kiran exceled with their dance artistry based on Bollywood songs. Nandini and Dr. Sayida, emerging local stars who have become popular for their sweet voices, gave excellent performances. Girish Nayak made the audience laugh with his dialogue delivery of Gabbar Singh from the film Sholay. The popular musician and singer Hemant Dave gave a star performance. The much appreciated event would not have taken place without generous from supporters like Subhash and Sarojini Gupta, Tandoori Nite restaurant, Amir Dodhiya of New York Life, Deep Foods, Aga’s restaurant, Nirvana restaurant, Lazeeza restaurant, Ila Driving School, Gujarati Samaj, Ashiana restaurant, NTV Houston, Tridev Investments, Viral Amin Commercial Insurance and Nu Trend, Houston.